The infiltration of militant homosexuals into the Catholic priesthood is a most terrible punishment by God upon an unfaithful Church. The betrayal of Our Lord, in 1968, by most of the world's Hierarchies, on His beautiful teaching of the holiness and sanctity of the Marital Act, has led to the near total collapse of the Catholic Church. Joseph Sciambra, carries a report that a militant homosexual, Orlando Espin, will be lecturing at the LA Religious Congress. He will be but one of a number of practicing homosexuals who will be trying to hoist unnatural sexual practices on Catholics. How should we combat the horror, the EVIL of homosexual perversion? The most obvious way is to teach that the Marital Act is truly holy and offers sanctification. Not in the manner of deluded neo-gnostics and frauds such as Christopher West, but in the manner of the Church. For example, Archbishop Fulton Sheen. Let us now review what the Marital Act is and what it is not. The Marital Act, is not a mere natural good (akin to eating food, as civil lawyer Chris Ferrara, turned self-declared theologian, erroneously claims, trying to refute the bizarre ideas of Christopher West). Ferrara wrote: "the physical act involved in reproduction (as distinguished from the soul infused at conception) can no more be holy than eating a good meal can be holy". Ferrara is of course absolutely wrong. (Incidentally, this man was permitted to affix his name to the so-called Letter of Correction sent to the Pope. Incredible). Placing Ferrara, and his errors to one side, let us review what a real theologian, Archbishop Fulton Sheen - following Our Lord Jesus Christ - teaches about the sanctity of the Marital Act. In doing so, we will understand how EVIL homosexual acts are. So HOLY is the Marital Act that Our Lord raised Matrimony to that of a Sacrament. When Spouses are in the state of grace, and engage in acts proper to marriage as a sign of self-donation, and not out of lust which profanes the marriage bed, grace is exchanged between Spouses. So holy is the Marital Act that the use of contraception is a very, very grave mortal sin. "Unity of two in one flesh is not something that God tolerates, but something that He wills. He wills it, He sanctifies the couple through its use". (Sheen, Three to Get Married, Dell, pp. 118-119). 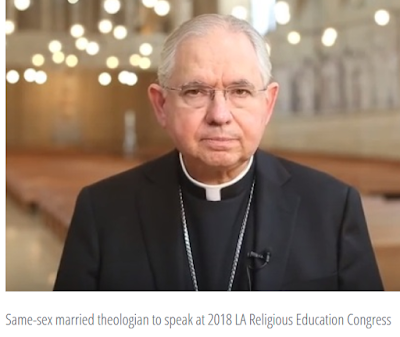 "Sacramental grace is communicated in the marriage act"
Now, we begin to understand the EVIL of men like James Martin S.J., Dan P Horan, OFM and other homosexualists (or homosexuals?) when they defend, excuse, obfuscate Our Lord's teachings on the sanctity of Marriage and the Marital Act. ONLY when Catholics truly understand and believe how HOLY the Marital Act is, will they UNDERSTAND how EVIL Homosexual acts are. The Marital Act is not a mere physical act. It is not a mere natural act. That is the act of animals. The Marital Act is between a man and woman in the State of grace, between two beings who are body and soul. Homosexual practices, as inverted perversions of the Marital Act, profane the human person - body and soul - by mocking and degrading the the image that man is created in. It is a mockery of the Marital Act, which is a reflection of that perfect Unity of the Most Holy Trinity. God loves Unity: man and woman, then Family, then Nation, then Humanity. Through Baptism we are all unified, incorporated into the ONE Mystical Body of Christ. Homosexuality is a counterfeit of this Unity. Homosexuality is the Deceiver's act of "unity" with the demonic, with Lucifer. Homosexuality was given a huge boost when so-called Catholics began to profane the Marital Act. When Catholics rejected Humanae Vitae - nearly en masse - sexual revolution, perversion was the result. Contraception, abortion, sexual infidelity (and divorce) - all these sins lead straight to the abomination of homosexual perversion. You're being quite brave, squirming out from the "homosexualist" weasel word, breaking open the core of the matter. A brilliant ray of Catholic sunshine in a dark sin-soaked world. Thank you. Thank you for your teaching on the truth concerning the Sacrament Of Holy Matrimony. I guess we needed to be reminded and in most cases, taught , that it is indeed, a Sacrament. There are only 7 and it is right there with Holy Orders. Your words have given me hope. I pray someone who doesn’t understand the beauty of the holiness of the Sacrament as well as the Marital Act reads this post . One by one the Truth will set us free.